I'd like to share with you our PDQ (*Pretty Darn Quick) Summer Throw! This 40"x60" lightweight throw is fast and easy with fringed seams and is great for those cool camp nights or for chasing the chill of too much air-conditioning! This is a great project for kids who'd like to make their first "quilt". Let's get started. This throw has no batting; the front and back are pieced together in a "quilt as you go" fashion with the seams on the OUTSIDE of the front using a 1/2" seam allowance. 1. Lay out your front strips in the order you want them be in the finished throw. You might want to label them 1-12, or just stack them in order. 2. Pair each backing strip with a front strip WRONG sides together. You should have 12 pairs. 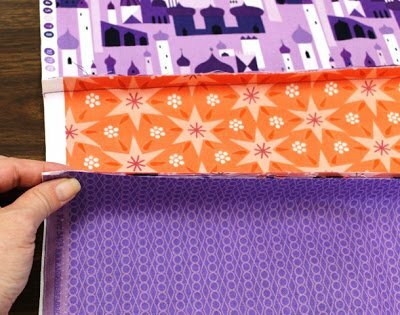 If you are using a directional backing fabric, make sure your strips are all going in the same direction. 3. Lay out Strip #1 and Strip #2 as shown. Notice that Strip #1 is wrong sides together with a backing strip, as is Strip #2. Make sure the left side selveges are even. 4. 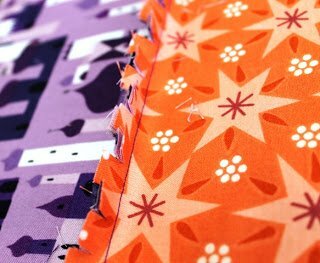 Pick up the pair of strips, placing them together with the backing fabrics face to face. 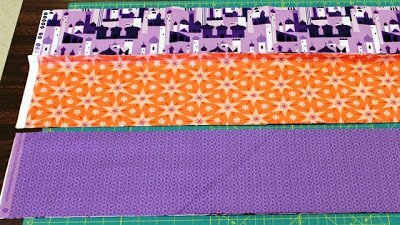 You should have 4 layers of fabric in this order - Strip #1, backing strip, backing strip, Strip #2. 5. Sew all 4 layers together from left to right using a 1/2" seam. Remember - the seam goes on the FRONT! 6. Open out the sewn strip set and lay out Strip #3. 7. Grab it the same way, and sew Strip #3 to Strip #2 just like you did before. 8. Continue adding each strip set until all 12 strip sets are sewn together. 9. See how the right side of the throw is all uneven? That's okay. You didn't do it wrong. All fabric widths are different. We're going to take care of that right now. Lay your throw on your cutting mat. Trim off both sides of selvedges to make nice, clean, selvege-free edges. No need to measure - just trim as straight as you can. 10. Stitch a straight line 1/2" from the edge all the way around the perimeter of the throw to secure all the layers. You could use a decorative stitch here if you want. 11. 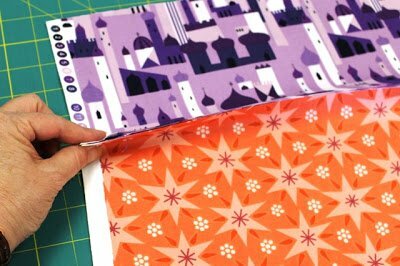 With your sharp scissors, snip all the seam allowances and the outer edge 3/8"-1/2" apart to make the fringe. Be sure you don't snip the seam line stitching! 12. Wash, dry, and watch your fringe "bloom"! I washed mine with a load of towels to help it fringe even more. Wasn't that easy? Here's a few helpful hints? 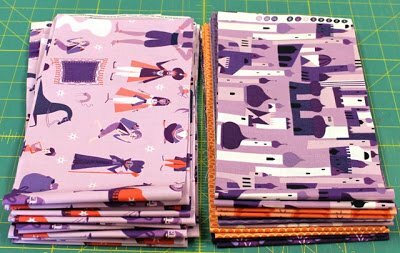 Pressing each strip set (front to back, wrong sides together) before sewing will help the fabrics stick together so that there's less shifting as you sew. 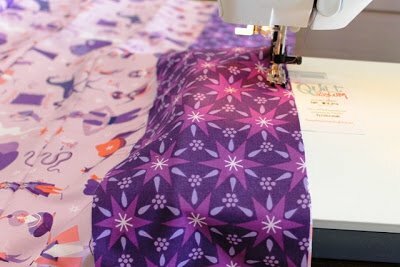 ALWAYS make sure that you are looking at the newest FRONT SIDE STRIP as you sew. 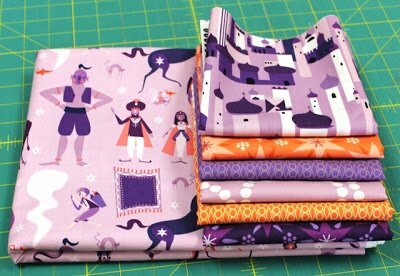 If the backing fabric is on top, it's a boo-boo and your seam will be on the back instead of the front. Don't have a 1/2" seam allowance marked on the throatplate of your sewing machine? My not-inexpensive German machine didn't either, so I made a temporary seam guide using two business cards. Mark a line 1/2" from the edge on one card. Slip this card under your presser foot and drop the needle down on the line. Place the second business card next to the one under your needle and tape that card onto the bed of yor machine. Remove the card under the needle and voila! Instant (and temporary) seam guide!